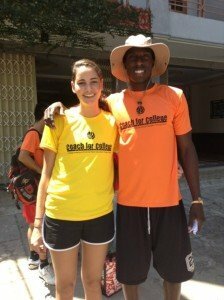 During the summer of 2013, two Princeton student-athletes were selected to travel to the Phung Hiep District of the Hau Giang Province in southern Vietnam to volunteer for Coach for College, a global initiative aimed at promoting higher education through sports. Isaac Serwanga ’13 (football, basketball, track &field) and Katharina Gebert ’15(lightweight crew) taught academics, sports and life skills over the course of three weeks to disadvantaged youth at the Hoa An Secondary School. The Princeton Varsity Club provided funding for the majority of the necessary expenses associated with the charitable service trip, with the remainder of the funds being raised by the individual participants. The PVC sat down with Kat and Isaac to learn more about their educational experience this summer. PVC: What were your expectations for the trip after you learned you had been selected to represent Princeton University? Isaac: In all honesty, I didn’t know what to expect. Not only was it going to be my first time as part of an extended service program, but it was going to be my first time outside the country. I knew I personally was going to be a foreigner in every sense of the word. Nonetheless, new surroundings, new opportunities, and a chance to share with young kids the things I’ve learned as part of my student-athlete experience excited me. I knew the trip I was about to embark on would be memorable, but how memorable and in what ways? I had no idea, but I was excited for the opportunity. Kat: I expected the trip to be hard work, but also incredibly rewarding. PVC: What were the most striking differences between your experiences in the United States and that of life in the area of Vietnam that you visited? Kat: The climate, food, and overall standard of living were incredibly different. The heat and humidity were, at times, unbearable. Their staple food is rice, meaning we not only saw a lot of it, but also ate a lot of it. There are not many parts of America where you can see your food (i.e. chicken) running around on the street during the day, and then eat it that very night. Though this might irk you, it was actually reassuring to see how fresh the food was we were eating. In addition, their cultural emphasis on family and uniformity results in a very sheltered atmosphere. The hotel we stayed in was run by a man whose wife cooked alongside his daughter, sister, and son. His children would run around during the day, serving food as need be. His almost 100-year-old grandmother sat at the front of the hotel to greet us. This sort of family business is very rare in America, while having your children, and their children, staying at home to work is very common in Vietnam. PVC: Can you tell us about what a typical day was like? Isaac: For coaches, the day began around 6:30 am for breakfast. Breakfast was very routine: 2 eggs, bread, iced tea, and an assortment of fruit. At 7:10 am, the bus would depart from our local hotel and drive us to the school we worked at no later than 7:25 am. In the morning from 7:30 am-11:30 am we would teach and coach 8th graders, switching off in 40 minute periods as the kids rotated from subject to sport. The last period was called “Life Skills.” This period in my opinion was the most important as well as the most fun. Depending on the week, we would teach the children about specific things they could apply to all aspects of their lives in a variety of ways. Teamwork and cooperation was taught through outdoor activities; creativity, imagination, and persistence were demonstrated through the children’s ability to create their own projects together. Our goal was to make sure after every fun activity we did, we left the kids with a take home message that allowed them to transfer these activities and lessons into developed life skills that they could apply to their own lives. After we returned from lunch (and sometimes a quick nap), we would repeat the same schedule as in the morning but with the 7th graders. At 5:45 pm when we returned to the hotel, dinner would be ready. Eggs, fish, chicken, beef, rice, vegetables, soups and an assortment of fruits were most commonly served. After some free time, we would meet up that night around 7:45 pm to go over our lesson plan and sports drills for the coming days. A game of cards, story telling, or T.V. watching with other coaches would often end the night. Kat: Our camp ran Monday-Friday for three weeks, with 8th graders in the mornings and 7th graders in the afternoons. We ate breakfast (noodles/rice) at 6:30 AM and left for the school at 7 AM. Camp started at 7:30 AM, with some students traveling over 1.5 hours by foot to get there. They would leave their homes as early as 5:45 AM in the morning, just to spend a few hours with us. All classes lasted 40 minutes. First thing in the morning, I would teach biology class to one group of students. Afterwards, I would teach baseball to another group of students, followed by another biology class, and lastly, one more session of baseball. As someone who has been to one baseball game in her life and who wasn’t aware until a year ago that there is a Sports Channel on TV, teaching baseball was a struggle. Though the students had never seen a baseball bat before, my own level of expertise was questionable. It didn’t help that as a German, deep-down I simply lack the appreciation of a sport where 90% of the time nothing happens – Germans just don’t tolerate such inefficiency. We would end the session with a life skills class, where we worked on teaching the importance of playing fair, studying, working together, etc. After our morning session, we would head back for lunch (rice) and a quick break. At 1 PM we would head back to the school. The schedule from the morning would be the same, but with a simplified curriculum for the 7th graders. By 5:30 PM, when we were all wiped out, we would head back for dinner (rice). Evenings were spent planning our classes for the next day. PVC: How did the language barrier affect your teaching/coaching strategies? Isaac: Each American coach was paired with a Vietnamese coach who helped tremendously in the beginning. Eventually, I learned the basic words and phrases I knew I would need on a daily basis so that I wasn’t completely dependent on the Vietnamese coaches. For me, I grew an appreciation for the value of body language. Because I spoke and understood very little Vietnamese, I integrated a lot of gesturing and physical examples into my teaching and coaching strategies. For example, when teaching prepositions, I would hide under desks and jump on chairs. I had the kids do the same. At times we looked crazy, but the kids loved it. Most importantly, it was a new way of learning for them, and it showed them that learning English could be a fun thing. Kat: The language barrier allowed me to become proficient in using my hands to communicate. After the first few days of teaching in the classroom, I realized that talking at the students about the digestive system was pointless: they had no idea what I was saying and quickly zoned out. I started acting out my lessons (or making a fool of myself) and played wordless games with them. Coaching was a little easier, since we could easily use demonstrations, and they were also far more engaged. The difficulty surrounding the language barrier certainly came as a surprise to me. As someone who has acted as a German-English translator in numerous situations, I didn’t think working with a foreign language would prove to be as challenging, and at times frustrating, as it was. PVC: Can you tell us a little about the children you taught as part of the program? Isaac: One thing I learned from being in Vietnam is that children are children. Whether you are at home playing with a little brother or sister, or playing with young kids from rural Vietnam—kids are the same. If they do not know you, they will be highly skeptical, quiet, and shy. It is your responsibility to open up, and be comfortable enough with yourself so that they can become comfortable with you. Once that barrier is broken, the real bonding as well as the actual learning can begin. They loved to have fun. They all had an abundance of energy that I had to match each and every day. They are fascinated with the American culture. Just like any kid, they want to learn about you and what your life is like back home. The more I opened up to them, the more fun we had. PVC: What is your favorite memory from the trip? Isaac: On my Orange team, I had a kid named Huu. He was a scrawny kid with a boisterous personality. Every day, he would be by far the most difficult child to contain. He would run from class to class, interrupting almost all the classes simultaneously. In America, we would label him a “trouble maker.” As a group, all us coaches spent nearly an hour discussing what we could do with him. We came up with nothing. For the last week, I saw great improvement in Huu’s behavior. When he would revert back to his bad habits, I simply asked him, “How did MJ overcome his obstacles?” He would look at me inquisitively, then sit back in his seat and fix his behavior. At the end of camp, Huu and I shared a special moment when I gave him the Michael Jordan book. I told him he has the potential to be a phenomenal student, and he told me that he will never stop trying like Michael Jordan. There were several touching moments like these, but this just gives you an example of how mentally, physically, and emotionally invested we coaches were in making sure we did all we could for these young students. Kat: The most memorable part of the trip actually occurred on the last day. All the coaches had returned to the hotel for the evening when all of a sudden we heard shouting from outside on the street. A few of us went downstairs to see what all the commotion was, and were greeted by a swarm of our students. They had biked from their homes across the town to come see us one last time. It was absolutely touching. PVC: How have you changed as a result of participating in Coach for College? Isaac: Participating in Coach for College was the experience of a lifetime for me. It challenged me to step out of my shell, and enter a place where I knew I’d be the overwhelming minority. It allowed me to grow, and discover new and different strengths that I never knew I possessed. In addition, Coach for College has renewed my fascination with the collegiate student-athlete experience. It allowed me to truly recognize what great skills and characteristics you can develop by being a part of a team. Sharing these skills with others has left me with a deeper sense of appreciation for everything that my coaches and teammates have taught me. Lastly, I have come to the conclusion that there is no greater gift than giving yourself to a cause. While financial donations and verbal support of a cause are admirable, nothing can match the physical and mental presence of embedding yourself in a new environment and a new culture in order to do all you can to help. It benefited me just as much as it benefited those kids to be able to teach them all I’ve learned from my student-athlete experiences. Kat: My global perspective on education, standard of living, and overall culture has dramatically changed, thanks to Coach for College. Without this experience, I’m not sure I would have ever had the chance to engross myself in a third-world country in this hands-on way. Though reading the newspaper and learning about “cultures different from your own” in school, actually seeing it firsthand is incredible. Of course, one very obvious change is my now near-fluency in Vietnamese (ok, near-fluency is slightly exaggerated). I have a new found appreciation for the amenities we take for granted here in the United States. On top of this, the patience I learned in working with the students will aid me greatly. PVC: What is the most important than you learned/realized from this opportunity? Isaac: Being a part of Coach for College opened my eyes to the true beauty of sports and the power it possesses on a global scale. After finishing my career as a collegiate athlete, I understood what a privilege it was to meet so many great teammates and coaches, and represent Princeton every time I competed to the best of my ability. But that was the limited extent of my understanding. Going to Vietnam to teach kids who barely recognized the name Michael Jordan helped me see and comprehend the bigger picture. Playing sports allowed me to break down all social, racial, and cultural barriers and connect with kids from Vietnam who I would’ve never had the chance to meet. Sports served as the bridge between these children and me. It allowed me to leave a lasting impact on kids that can drastically change the projection of their future. Some kids had the idea that they could not go to school outside of Vietnam. Others told me their dreams of being engineers, doctors, and singers, but almost all didn’t think it was possible because of their current circumstances. This program was life changing for these children—as well as for myself—because their doubt was replaced with hope and belief. And in the end, I’ve realized that all of this was made possible through the power of sports and the great lessons that can be taught through them. PVC: What would your advice be to current Princeton undergraduates about participating in this program? 1) Have an open mind to a different culture, different way of doing things, and different lifestyle than you are accustomed to. It will help you get the most out of the experience, and it will help the native people grow comfortable with you more quickly. Not only will this make your job easier, but it sends a great message that you are willing to learn and are up for friendly interaction. Unless you are fluent in the language, you will most likely be laughed at, but it is a great ice-breaker and a great way to make friends. 3) If you shop (you will shop), the first price to come out of the sellers mouth will be what I call the “Foreigner’s Discount.” It won’t be a discount, but most likely a 300% mark up of the actual price. There is the assumption that you have all the money in the world because you are American, so make sure you shop with your Vietnamese counterparts to get an accurate pricing. 4) Do it! Coach for College is ran very well, and can be an amazing experience if approached with the right mindset. Kat: Go for it! Not only should they apply, but if accepted, they should embrace the opportunity wholeheartedly. The only thing that can keep them from learning about and enjoying themselves is their attitude. The Americans that came in with an open mind, ready to embrace a new culture, were those that benefited from Coach for College the most. By the end of the month, my fellow coaches and I got very used to shouting “When in ‘Nam!” whenever a new situation presented itself. Chances are, you’ll only be in Vietnam once in your life, so it’s the perfect time to go snorkeling in murky, probably unsafe waters or eat chicken feet or visit a dragon-shaped bridge that spits fire at midnight.